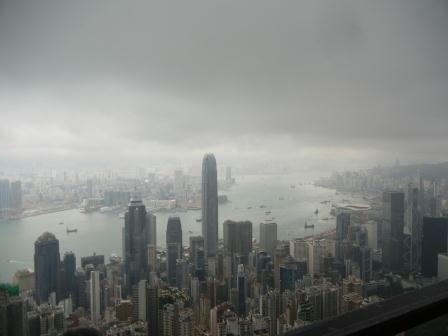 One of those strange coincidences put me and my parents in Hong Kong on the same day. 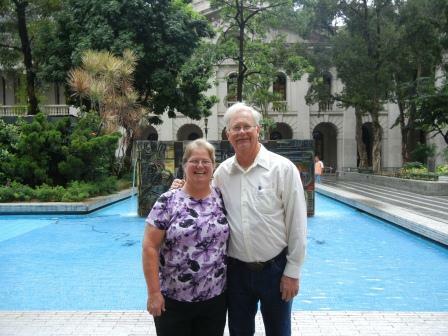 When we booked the RTW ticket last November, travel was also on my mother’s mind and she booked a China tour. As we were talking about them both, I asked her what days they were on Hong Kong and it turned out that Oct 11 was the day they landed. Knowing that we would both be in town, I made sure we booked a guide and found Jamie Lloyd http://j3tourshk.posterous.com/ I knew by this point in the RTW trip that I would be tired of the planning and arranging and frankly trying to figure out every new subway system. Since their flight landed at 7:20 AM, we set to meet at their hotel at 10:30 AM. Earl and I got a chance to call and get our flights changed to the original itinerary on Korean Air and honestly glad we don’t have to figure out how to spend 14 hours exhausted in Seoul. Earl was a little disappointed that he wouldn’t get to fly on the A380, but the extra sleep was well worth it. We took the Star Ferry over and found the hotel with a little effort. My mom and dad were already talking with Jamie and we got started in the tour. First stop was to get Octopus transit cards, get on the subway and then get umbrellas at the 7-Eleven. (It is funny that you can’t find a 7-Eleven in the US, but they are still going strong in all the countries we have been too besides Germany). 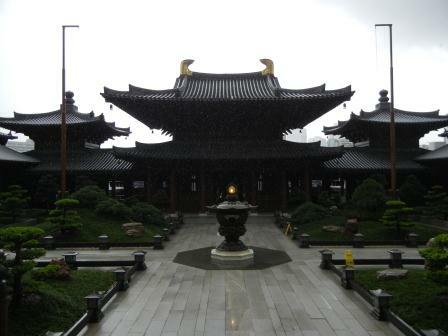 First stop on the tour was the beautiful Chi Lin monastery (Nunnery), this was a great first stop even in the rain. You can see the mist in this picture if you look closely. We walked through this and the accompanying Nan Lian Gardens that had huge koi (carp) and some very expensive and specially mined rocks. Then we were back on the subway to lunch. Jamie had picked out a great restaurant, Din Tai Fung for some fabulous dim sum. Jamie and my mother had picked out our meal and they brought the first things to our table right after we sat down. Earl refused to eat the wonderful vegetables, but the fried rice and all of the dumplings were fabulous. After lunch we took the Star Ferry back to the Hong Kong side and walked to Statue square, which was originally called that because of the statues of Queen Victoria and Prince Albert, but now only has a few sculptures and a statue of a banker that looked to me to be Mr. Banks the father in Mary Poppins. We then went on the tram to a local market where the fish were very much still alive in some of the trays and not just the fish called zombie fish, whose hearts keep beating even after they are cut open. Gotta say, I like my fish in white paper packages in the refrigerator case to this out in the open version that is so normal in the rest of the world. We then grabbed a couple of taxis to get to Victoria Peak. Once there we took the Hong Kong Trail up to the top to get a great 180 degree view and a nice nature walk in the process. We were so close to the clouds once up to the top. After walking back down to the main entrance, we took the tram (backwards) down to the bottom and took the subway back to my parent’s hotel. They had dinner at 6:30 to join their tour group and were real troopers for sticking with the whole tour after their 36 hours since they left Houston with very little sleep in between. Tomorrow we start our flight to Sydney! See you in Australia!